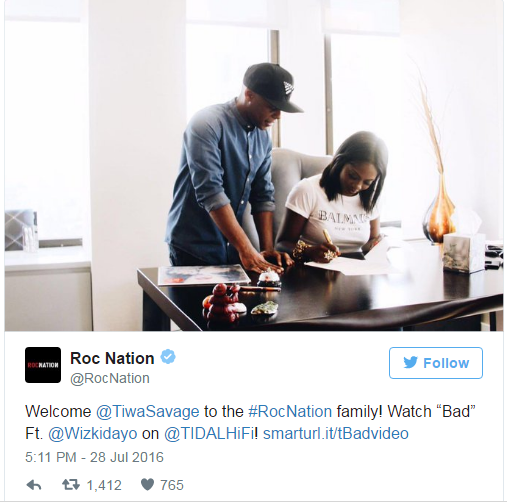 Roc Nation, owned by Grammy award-winning American rapper, Jay Z has officially welcomed Mavin queen, Tiwa Savage into their record label. The songstress is now officially the first Nigerian artiste signed to the reputable international label. Although not much is known about the deal, it is believed that Tiwa signed a management deal with Roc Nation in conjunction with Mavin records which will see her music and brand promoted in foreign countries including America and others covered by Roc Nation. An excited Tiwa who is now single and searching, shared the news of the official signing on her Instagram page. Along with a video thanking her fans and her crew for their support, she gushed, “Signed, Sealed, Delivered. It feels like home. I’m really really excited. A huge thank you to my Mavin family, Don Jazzy for making this dream come true. Thanks to the fans”.